I had a really productive weekend on the allotment. I’d been itching to get down to the plot all week, so was pleased when Saturday came around. It’s odd, that as I work for myself, I shouldn’t feel guilty about going to the plot during the week, assuming that my “paid” work is up to date and I’m not letting a client down by being there, but I guess some habits are hard to shake and being on the plot Monday to Friday still feels a little weird. Maybe if I did it a little more frequently it would feel less weird? Anyhow I knew that I had a lot to do, mostly weeding, as we’d had a warm, humid but wet week, so everything but in particular the weeds was growing well. Some of my plants in particular the leeks and the most recently planted brassicas were in need of some weeding. I had a little experimental dig of my early potatoes. Technically they shouldn’t be ready until the beginning of July, but they’re already starting to go over, so they appear to be ready. I dug the end of the short row, as that area is one that I’ll need again fairly soon, for my overwintering brassicas. I dug the first couple of plants and got a kilo of spuds for my efforts. We had some of them for supper that evening, along with the chard, runner beans and a “crustless” caramelised red onion and cheddar quiche that I knocked up later on. The spuds were amazing. They’re a variety called Arran Pilot, and tend to be quite a floury potato and can go quickly to mush if over-boiled, but I cooked them in a steamer and they seem to have held together much better. Whether it is the more gentle cooking action of the steamer as opposed to boiling I don’t know, but anyway they were delicious and I don’t think we’ll be buying potatoes from the shops for a while now. 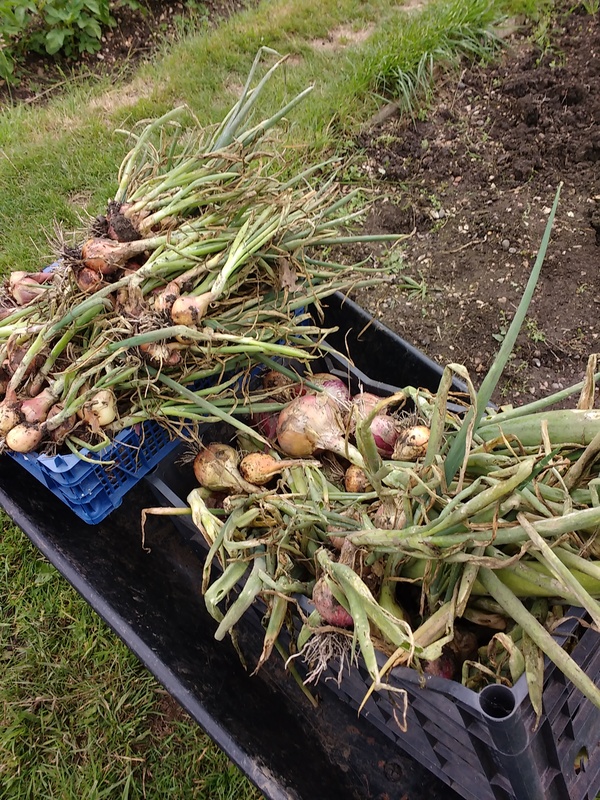 I also lifted all of the over-wintering onion sets and shallots. They too had started to lean over and were ready to be harvested. They need to be dried a little, and sorted through, which I’ll do some when in the next few days. I noticed there were a couple that need to be eaten sooner rather than later due to basal rot, but the vast majority should store well. Another item that we won’t need to be buying from the store for some time. I dug over the area where they were, and sowed some mixed coloured beetroot there. I’ve left some space as it’s close to where the courgettes and cucumbers are, and I expect they will spread out a little. The radishes and turnips were next on my list, as they haven’t done anything apart from bolt and go straight to seed. I’m not sure why, but I removed them, dug over the ground and have replaced them with Perpetual Chard (a gift from Dale Calder in Canada) and some Rocket. The latter I had previously sown earlier in the year, but it failed to germinate, so I’m hoping for better luck this time. The rest of the time I spent weeding and tidying. It looks as though the first of the soft fruit (loganberries and gooseberries) might be ready this week, so I’ll keep an eye on those but otherwise there is plenty of other veg coming to keep us fed. 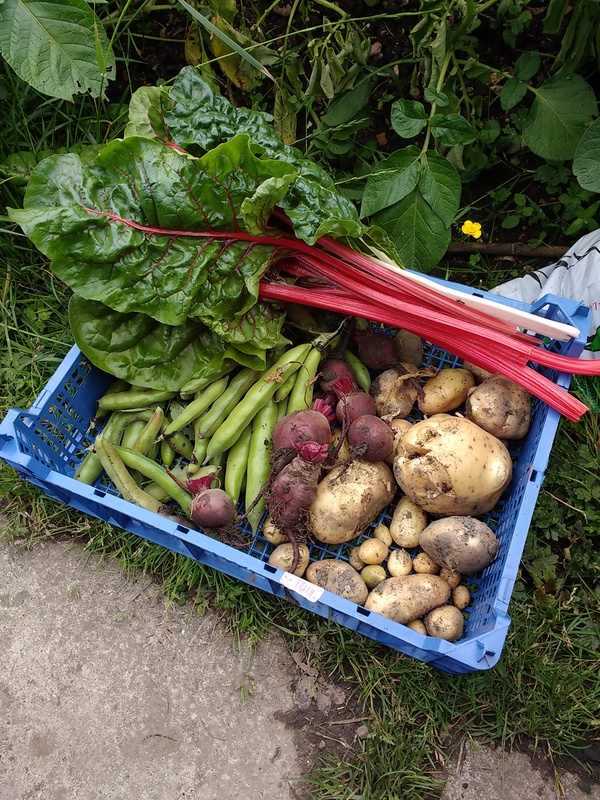 This entry was posted in Cooking, Fork To Fork, Garden / Allotment, Self-sufficient, work and tagged allotment, chard, cooking, fork to fork, onions, potato, Rainbow chard, rocket, shallots. Bookmark the permalink.